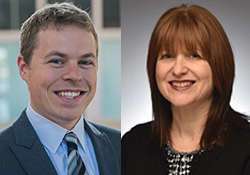 Brett Belock and Mary Kuhr Anderson have joined Beacon Health System as Innovation Project Consultants. Both worked for Michiana based companies prior to their hiring, and both hold Master of Business Administration degrees from the University of Notre Dame. In their new roles, Belock and Kuhr Anderson will oversee projects in Beacon’s Innovation Lab, helping to further the company’s commitment to innovation. The team will evaluate projects and guide them from conception to implementation, with a dual focus on customer experience and improvement of internal processes.